Natural wine is a divisive subject. I enjoy many natural wines. I like to drink them. So do many others. They bring me great pleasure. I don’t really mind that there is no strict definition for ‘natural wine’. If someone wants to call their wine natural then that’s fine. It is a useful banner under which like-minded wine growers choose to gather. When we visit a natural wine bar, we all know what sort of wines will be served there. Much of the controversy comes from the way that supporters and producers of natural wine have briefed against ‘conventional’ wine growers. This is a shame. Natural wines can stand on their own feet, and don’t need to justify themselves in opposition to more conventional or commercial wines. Some of the aggravation, though, has come from members of the wine establishment, who have been offended by what they consider to be faulty wines. They display insecurity: they need to be able to label and compartmentalize wine, and it blows their fuse when they encounter something a bit different. The wine establishment seems threatened by the way that ordinary people have embraced natural wine and enjoy the experience. Wine educators feel undermined by this success, because the sometimes rigid dogma of wine education leaves no room for natural wines. I think it would be a mistake for ‘natural wine’ to be defined. The natural wine movement is counter-culture; it’s revolutionary. To nail down a definition would be to strip it of some of its soul. A vague set of guidelines (not rules) are in order though. Natural wines will usually be made with no additions, save for some sulfur dioxide (usually just a little at bottling). Some strict naturalistas advocate working with no sulfur dioxide at all, and surprisingly many get away with it. Most will not filter or fine their wine. Most will avoid new oak, and many will avoid small oak barrels. In the vineyard many are working biodynamically or organically. But there are some who work sustainably, but not organically. There is quite a bit of overlap between natural winegrowers and the more enlightened conventional winegrowers. In fact, there are many wines which aren’t considered ‘natural’, but could in fact fit happily into this category. That’s OK.
One valid criticism of the natural wine movement is that it can be process focused, rather than concentrating on results. It is obsessed with how the wine is made, not how good it is. I see working more naturally as a way of achieving greater terroir expression in a wine, but there is a point at which the wine can end up tasting more of the process than it does of the place. Of course, not all wines have to express terroir. For example, orange wines (skin-contact whites) can be quite delicious, but not necessarily show a sense of place. Sherry and Madeira are fantastic, but is that terroir you are tasting? It’s a very complicated argument. What does terroir taste like? What is ‘sense of place’ in terms of flavour compounds? I think that there’s a place for cheap, natural quaffing reds that taste ‘natural’ more than they do of a specific vineyard site. These can be truly joyful, and quite elegant. But if the vineyard has a strong personality, then the winegrower will seek to express this in the wine. Being too natural might cause this vineyard personality to be lost. Overall, though, we should relax. The natural wine category, undefined as it is, is doing fine. Lots of people are having fun with some interesting wines. The flavour space of wine has developed. The traditional fine wine market shouldn’t feel insecure. There’s room for all manner of approaches in the world of wine. Let’s celebrate the good and tell people about the wines we enjoy. Bad wine will always be with us, and we shouldn’t let this become our focus. Marvellous! Great piece! Totally agree. While I have certainly enjoyed a number of “natural” wines, and believe winemakers should be free to use whatever methods they think best, I think the term itself is neither useful nor appropriate. It’s not useful because anyone can abuse it (“all natural” has become meaningless on food labels) and I believe inappropriate because wine is not a natural product – it’s made by humans. Before I saw this article I wrote up a post as a response to your tweet of the other day on the topic – if you have a spare moment please do take a look. This is like the ‘classical’ music scene 30 years ago, where people began using ‘period’ techniques (gut strings, valve-less trumpets, no vibrato,speeds based on historically researched metronome markings). This was billed as a reaction against what was seen as syrupy, bloated performing practices of people like Bach, Handel, Mozart & Beethoven by big orchestras at the time. When this got out of universities in the early 80s, problems began when they started calling themselves the ‘authentic’ movement and there was a fair degree of backlash from traditionalists (‘making Beethoven’s Ninth sound like Telemann’s tafelmusik’ was one jibe, as was ‘I wouldn’t use an 18th century toilet, so why would I use an eighteenth century piano/violin/trumpet/cello…’). Its fans liked the clearer textures in the sound (woodwind wasn’t drowned out by modern strings), the supposed absence of over-interpretation (although clearly it was an interpretation, just a different kind of one) and generally fresher, lighter speeds. And what happened then? Within 10-15 years some of the most traditional orchestras on the planet started working with the period pioneers. While the Vienna Philharmonic is never going to play on pigs-gut strings, they have shown they can adapt their performing practices to meet the period world half-way. Lots of ‘traditional’ conductors now in their 50s use period approaches with their ‘traditional’ orchestras. Great post, Jamie, I wish I could write as clearly as that! I think this is the post on natural wines that I’ve ever read, that best encapsulates my own position and thoughts. 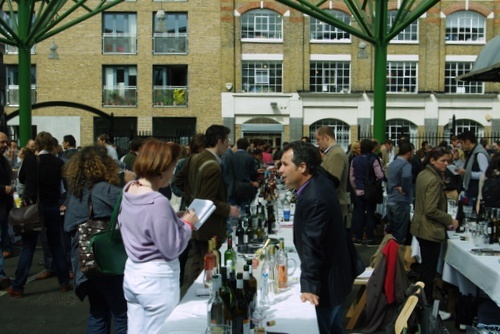 -How can natural wines be of benefit to consumers and to the wine world as a whole? -When is fault not a fault? -Do/Can natural wines express terroir better? -or how about a reasoned and sensible debate on what exactly are “natural wines”, “industrial wines” and the interesting grey area inbetween? Responding to first comment: Wine is not natural because is made by human? So, human are out from nature? Perhaps this is true in the city, not in most vineyards: although modified, that’s nature and we feel part of it. Wine is made by human? Not true; we cooperate, but wine is mainly made by vines and by yeast with our help. I believe a so-called ‘natural wine’ is that in wich the amount of ‘help’ of the human is the less possible (provided it can’t be zero), and this varies a lot depending on the mind and ideas of the wine-maker. So what’s natural for someone may not be natural for another. But for me natural, really natural, is no sulphur at all, never. And this can be made! I like the music metaphore. However, I see the two more as the difference between modern amplified and traditional acoustic music. It would be funny to see the hordes of fans chanting to a Bach’s concerto. Probably in the same way as to see a still and frozen audience on a techno party. Every musical style has it’s purpose, type of fans, behavior, places where it feels appropriate to listen to it. So does wine. The only time I get mad about conventional winemakers is when they go around my vineyard spraying their lot with chemicals, when they poison the soil we share. Probably in the same way a classical audience will be mad about a techno party taking place next door. Quite a can of worms wriggling around here. One thought though: with 13.5k Twitter followers, Wine Blog of the Year Award 2012, international judge here and there, and several books under your belt, I think you’re pretty much part of that “wine establishment” Jamie, whether you like it or not. Hmmm, odd post and I wonder what sparked it in the first place. It seeks to find a fair and balanced approach to a trend which is here to stay, so that’s good. But, it seems to me anyway, that it criticises the so-called establishment more so than the advocates of “natural” wine. For example, you state “If someone wants to call their wine natural then that’s fine” but I seem to recall howls of outrage from lots of so-called natural wine producers over Gerard Bertrand’s wine with Naturel in the name, which makes me wonder is it actually alright for anyone to call their wine natural? What if Gallo or Jacob’s Creek released a “natural” wine? This issue arises precisely because a group of low-to-no sulfur winemakers adopted a term as a marketing strategy as an easier way to differentiate their philosophy from the mainstream; so, with all due respect, it is kind of up to them to decide what “natural” means and how it is determined. Next, we have the unnamed “wine establishment, who have been offended” and the favourite enemy, “Wine educators feel undermined by this success, because the sometimes rigid dogma of wine education leaves no room for natural wines.” I am a wine educator and a member of the establishment and I would love to see an actual quoted example of this dogma which I have never seen. I teach at every level, from complete novices to Master of Wine students and I have no idea why anyone would think that so-called natural wines cannot “fit in” with the way we teach people to taste. I expect MW students to be able to taste “natural” wines in precisely the same way as they do any other and to base all judgements on sound tasting and good knowledge. Ordinary consumers are looking for enjoyment so if the wine tastes good enough and they can afford it, why would any teacher object to a “natural” wine? The issues, especially when dealing with ordinary consumers rather than professionals, are price and variability. Despite what may be said, consumers dislike variability, especially if it is associated with a higher price. Having said that, any good teacher can enthuse a group to try a wine but no teacher can get everyone to like the wine – whether it’s [yellow tail], Domaine de la Romanee Conti or a “natural” wine. It is up to the individual taster to decide for themselves if they like a wine and, if I were to criticise the “natural” wine movement it would be over the proselytising message that “natural” MUST be better – not so! It may be from the point of view of the producer, but the consumer alone is the only judge of what the consumer wants to drink. I’m not sure the Wine Establishment has indicated any sense of being threatened by the movement you describe. The beauty of Natural Wine is that it is such a diverse category of wines. Interesting thoughts Jamie, I havent heard that many ‘normal’ producers bagging natural wine, but I have heard a lot of ‘natural’ winemakers bagging the methods they use. Taste em blind, if they are good they will succeed on their merits. Dermot, I think (to be polite) that you have missed the point. So let me put this from the point of view of a well-educated, broadly engaged, amateur (and yes, I’d love to do an MW for fun; having done a D.Phil, it is the only exam I would now ever wish to do …). As an amateur, I’m less concerned about whether one is natural/biodynamic/organic or of some similar persuasion; however I do notice the difference between industrial pub wine (Yellow Tail) and what you might call boutique or authentic wine, to give it a wider umbrella. What, for instance, are we to make of Anne Gros or Cecile Tremblay? neither of whom hang their hat by the natural wine movement as such but both of whom might be called ‘authentic’, as is most certainly DRC and A&P de Villaine. I attend about 40-50 tastings a year and sample maybe 2000 wines (yes, I am an amateur really, I just really enjoy wine), and I notice a real difference between craft ‘authentic’ producers and industrial conglomerates. Part of it is the attempt by the mass producers to ‘rectify our palate’ with additions of colours, alcohol, sugars and whatever else they deem necessary to provide consistency. My wife calls this ‘pub wine’, as now do I: it does the job of getting one under the influence, but the wine is dead. Natural, authentic, boutique or craft wine wine is altogether different. Have I had bad bottles? Certainly. Is there a learning curve? Of course. However, once one has tried wines by Foillard and Bressan, or Foti and Sottimano then one is into a different kind of experience altogether, and it is one which is both more culturally enriching as well as pleasurable to experience. Having embraced, as a consumer, the arts and wines of such dedicated producers I will never go back. Yesterday, for instance, I tasted an ‘almost’ wine by a producer from Savoie, but it just lacked that final edge that I have found in the wines of Berlioz and Belluard: close, but no banana. On the other hand I had a wine from Etna that was superb. Many wine merchants would like to think that because they think a wine is OK, so should we, but their standards are often not demanding enough. There is nothing like asking a few tough questions of either a vigneron, or a merchant, to see what they know about their wines (like how many grams of residual sugar is there in this? or, what clones did you use?). Even some of the more ‘famous’ merchants I have found to be fakes when one holds their feet to the fire. ‘Natural’ authentic wine invites the consumer to be far more aware of the winemaking process, and to be far more critical in one’s evaluation: that can only be a good thing. Jamie, this is a quite good attempt at reconciling the recent trend to label wines as «natural» against the backdrop of wines as they have been «traditionally» made, labelled and marketed. «Natural» labelling is mostly aiming to purvey the idea of a «low-input» winemaking, usually also coupled with «low-input» viticulture. The main problem with the word is that, by opposition, what is not natural has to be artificial! And that’s where all hell breaks loose. Because, like all other wines, «natural» wines do have their share of artificiality: vines are cultivated artificially (only wild vines in their original forest habitats could be considered natural); grapes are transported «artificially» (by means of tractors, trailers or even on the back of someone but inside a plastic bucket or a withe basket); are fermented and stored inside artificial vats (made of cement, plastic, steel, wood or stone, all of which do not occur in Nature in a usable state); are offered the consumer in artificially made bottles of glass or plastic bags or paper boxes labelled with artificially made paper printed with artificial ink. In order to be natural in the strictest sense wine would have to be made with no human intervention, just harvested from nature like honey can be. Of course, this is a strict impossibility as in nature you have no wine, except for a few brief moments, when the juice out of a fallen and squished grape bunch becomes wine before becoming vinegar, the latter, yes, a naturally stable product of nature. Even in this situation, objectively, what really happens is that you have the 3 states (juice, wine, vinegar) happening at the onset of fermentation simultaneously, until with time it all becomes vinegar. Wine is, thus, an unstable meta-state in the process of conversion from grapejuice into vinegar and in no case it is possible to have it without human intervention. That is why, in the more reasonable and thoughtful definitions of terroir, Man is considered the fourth essential factor, alongside grape variety, soil and climate. In conclusion, I propose that all wines are a blend of naturality and artificiality there not existing a single one which is 100% of either. You may plot any wine in a chart displaying a line from naturality to artificiality but it would be very unwise to draw a border from which you could call natural to the left of it and artificial to the right of it, as it would be a matter of subjective and failure-prone choice, the level of naturality a wine should have to be called natural. I also agree with your stance: anybody should be able to call their wines natural. Besides, this «category» has been created by producers who wanted to stand out from the rest. Until it was raised, no consumer ever had any doubts regarding the naturality of any wine, deemed to be the most natural of all foodstuffs present in any supermarket or wine list. And indeed, it probably still is…! @Mark, yes, I think it’s very useful in a discussion to distinguish between mass-produced commodity wines, and fine wines; they are produced and consumed according to different criteria. @Antonio, I agree with your vision of a line of artificiality/naturality of wines, but maybe one day the authorities really will pass legislation that draw a border!!! Interesting response because, as far as I can read, you didn’t address any of the points I made. My major criticism of the piece is that it attacks a perceived “establishment” for being unfairly biased against “natural” wines. I pointed out that I have not seen this and, as a member of the education fraternity, I am well aware of what is taught and how it is taught. Further, I pointed out that some of the perceived divisiveness over “natural” wines emanates from the so-called movement itself. I further pointed out that ordinary consumers look for consistency and value for money and that while it is possible for a teacher to enthuse people to try the unusual, this doesn’t usually happen of itself. Eh, no. They are in a business and they choose wines which they feel (or hope) are to their customer’s tastes. If not, they go out of business. The costs of running a retail operation are quite substantial and so all merchants choose, as best they can, a range which matches their own philosophy to their customer’s tastes. 2)but their standards are often not demanding enough. There is nothing like asking a few tough questions of either a vigneron, or a merchant, to see what they know about their wines (like how many grams of residual sugar is there in this? or, what clones did you use?). I know very few people, including MWs, who believe that they must know RS data or clonal data before they’ll buy a wine. For most of the people I know, if they like it they’ll buy it. I have never asked any of these questions of a merchant unless I am buying for a class and need the data. This sounds horrendously nerdy to me. 3)Even some of the more ‘famous’ merchants I have found to be fakes when one holds their feet to the fire. Potential libel except you didn’t name anyone. However, making broad sweeping statements is not the way to make a case. Define “fake”, name the merchants, put yourself to the test so we can be sure that your ability to judge a wine merchant is, in fact, good enough. Judge not others, lest ye also be judged. 4)‘Natural’ authentic wine invites the consumer to be far more aware of the winemaking process, and to be far more critical in one’s evaluation: that can only be a good thing. So, never having done a D Phil, or a PhD for that matter, let me reiterate my points. The so-called natural wine movement causes as much perceived division as anyone else does. I do not subscribe to Jamie’s notions of some out-of-touch establishment which has its mind blown by the odd and unusual. I do not subscribe to Jamie’s notion of wine education dogma which determines that “natural” wines have no place in the classroom. I do subscribe to the view that “natural” wines can be very interesting and rewarding, but that some are not. I also subscribe to the view that plenty of wines made by plenty of other winemakers can be very interesting and rewarding, but that some are not. Finally, I believe that Jamie has attacked the establishment without making any case at all and, having seen this before, I find this boring. Those were the points I made which I do not believe have been subsequently addressed. I don’t care if anyone doesn’t address them but I would hope that any response directed at me would cover what I said and not something completely different. Natural is a little like non-interventionist. All great words for marketing which mean nothing. But shouldn’t every word or phrase we use mean something? They should mean something, every word and term should have a definition. Until then vigneron’s within the natural wine genre will disagree amongst themselves, as they do now. They are divisive themselves, no need to bring up the vs. conventional argument. Labeling is important. Why should ‘reserve’ mean something in Italy and Spain and nothing in New Zealand or Canada? Terms need to be defined. You can not call yourself biodynamic without certification, certification that defines, by the certifier at least, what being biodynamic is. Natural wine should be no different. Reserve wines should be no different. Non-interventionist winemaking should be no different. Natural were always meant to divide, that is part of their appeal. They are divided in their approach to winemaking and viticulture. They are divisive in nature.